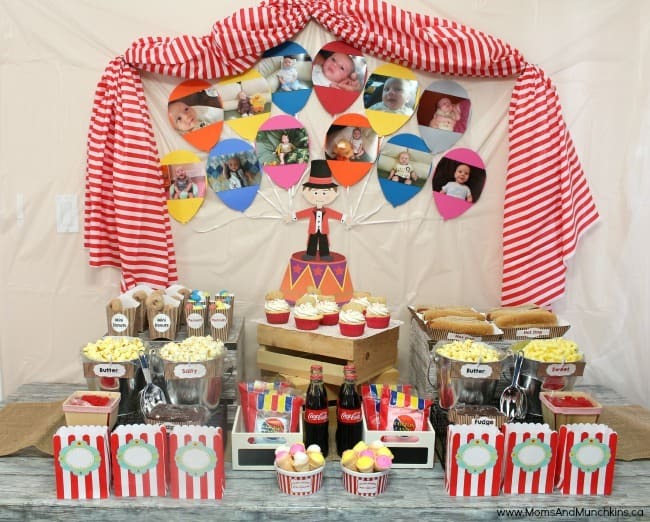 Have fun creating a big top party with these creative circus party ideas! Kids will love the activities, food and colorful decor. I had the pleasure of working with Birthday In A Box on all of the party photos featured here. Visit Birthday In A Box for all the fabulous party photos and many more ideas! Your circus invitations could be a standard paper invitation or they could have a fun twist like being designed like a ticket to the circus or a circus promotional poster with your child as the ring master! One of the great things about a circus party is the wide range of colors that you can include. 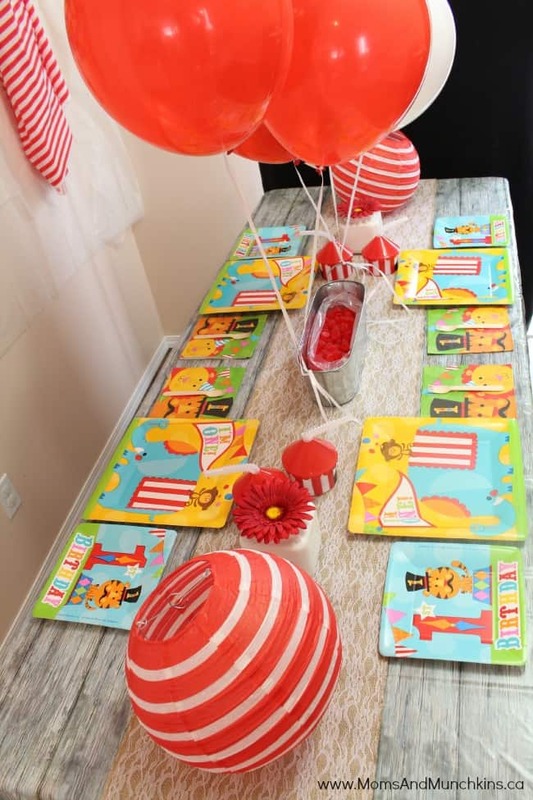 Balloons, table linens and streamers can be all colors of the rainbow. Plenty of balloons can really set the theme for a circus party. 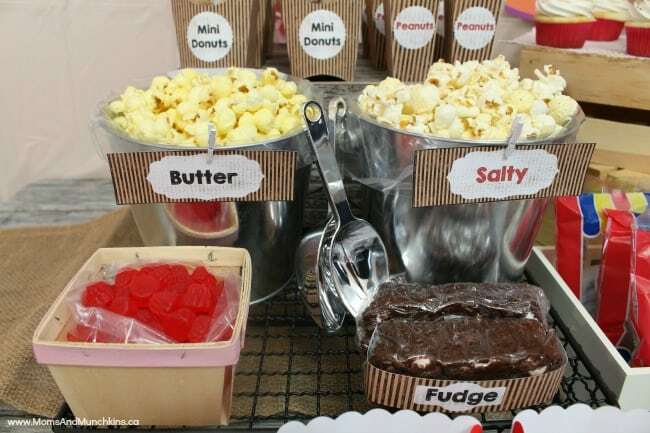 You can also place signs such as “concession”, “games” and “tickets” around the party area. 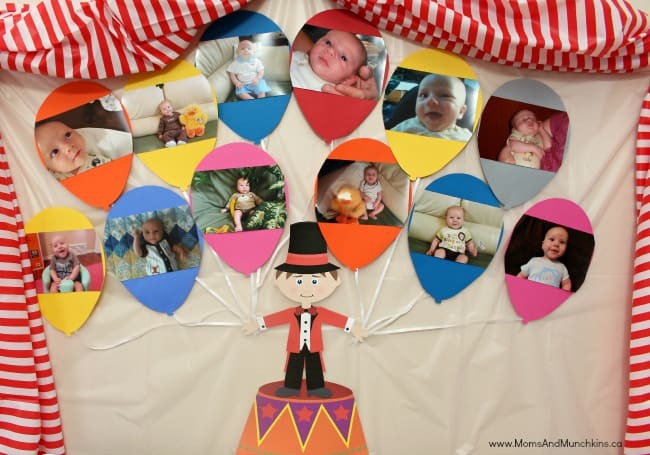 Try setting up a photo area with a circus cutout or put aside some clown wigs, over sized glasses, clown bow-ties and clown noses and have the children pose for pictures. This would be a great photo keepsake as well as a nice added touch in your thank you cards. There are many carnival games you can purchase and use for activities at your circus party. Here are some ideas for games you can make at home. You can award children tickets when playing games and they can use these tickets for treats from the concession stand. As children arrive to the party, you can have them complete a craft of making their own clown party hat to wear. 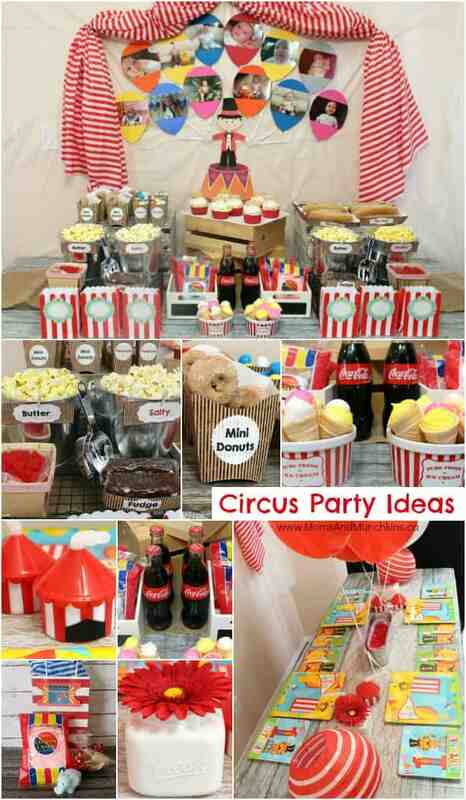 Circus party food is just as fun & easy to make as it is to eat! 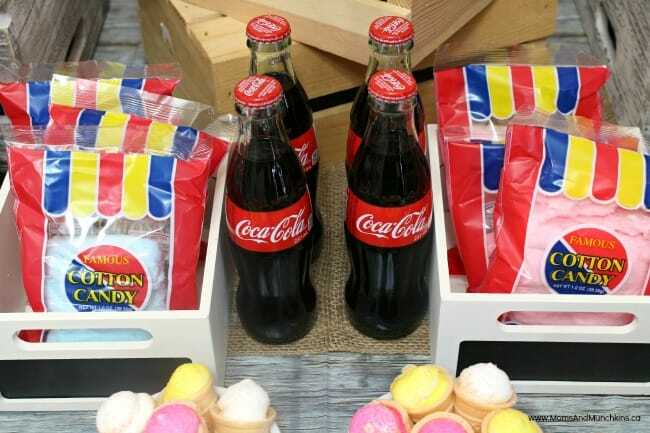 Serve hot dogs, corn dogs, mini burgers, fries in cones, cotton candy, mini donuts, peanuts, popcorn…the possibilities are endless! All these foods are sure to be a hit with the little guests but make sure there are no allergies before setting out peanuts on the party table. Circus cupcakes can be in a wide range of colors and can be as simple as a few confetti sprinkles on top or circus-themed cupcake picks. 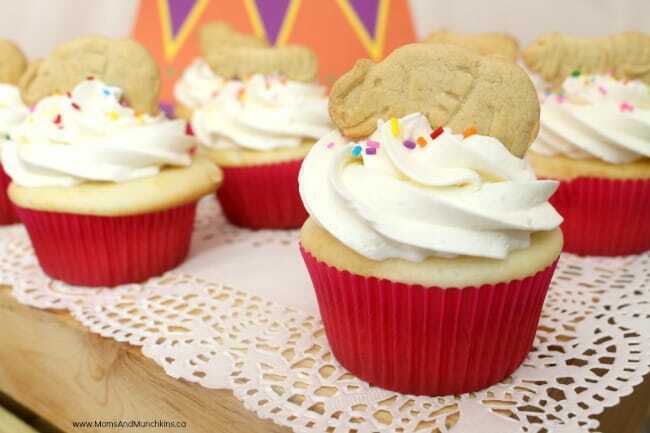 Kids love animal crackers and they make a delicious topper for cupcakes! 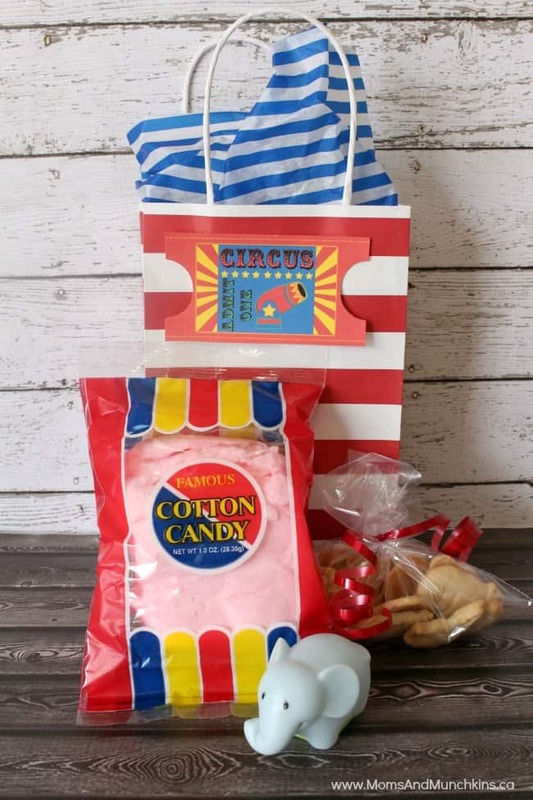 Clown noses and cotton candy are just two of the many items you may want to include in the Circus Party treat bag! What is your favorite part of the circus? We’re always adding new party ideas. Never miss an update by following along on Facebook, Twitter, Pinterest and Bloglovin’. I always love a circus theme! My daughter is turning 10 not sure if I could talk her into it, but it will always be one of my favorites. I decorated a nursery in that theme it was super cute. Dropping in from the Alexa hop hope you can visit me! Thanks! !